A giant curtain surrounding a plot of cloud forest on the border of Peru’s Manu National Park. CUSCO, PERU—British scientist Dan Metcalfe is attempting to take the clouds out of cloud forests. It sounds like something out of an Ian Fleming novel, but Metcalfe is no Bond villain, and his plan to remove clouds from a portion of forest in Peru with a giant cloud catching net is not part of some sinister plot. Rather, Metcalfe hopes that his wild experiment can help protect these rare ecosystems from being destroyed by climate change. Cloud forests—mountainside jungles persistently enshrouded in mist—thrive at high altitudes, usually between 400-2,800 meters above sea level, in countries along the equator. At this elevation, warm, wet air rising up the mountainside cools and condenses into clouds that continuously drift through the forest, supplying the entire ecosystem with water. But, what will happen to these forests if cloud levels rise, as some scientists have predicted will occur due to rising global temperatures? 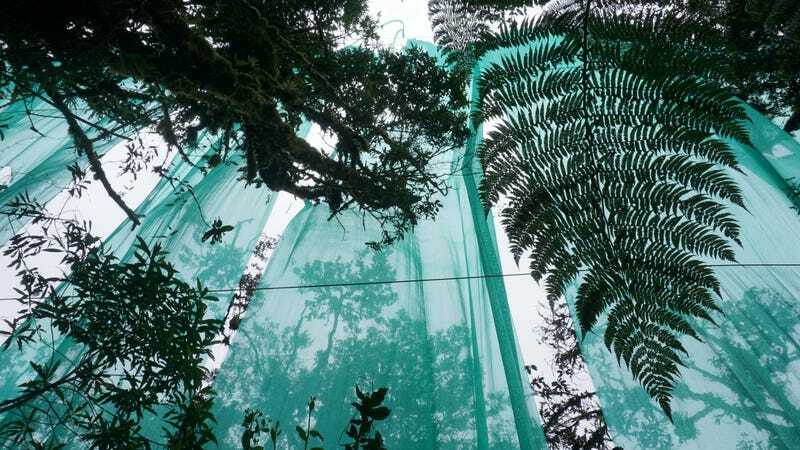 That is what Metcalfe, an ecosystems scientist at Sweden’s Lund University, is determined to find out by constructing a giant curtain roughly half the size of a soccer pitch around a plot of cloud forest on the border of Peru’s Manu National Park. “It’s simple in a way, but logistically challenging, we are just literally removing or reducing the number of clouds that are getting to a portion of forest, and then seeing what happens to that forest,” he said. The cloud forest curtain viewed from a distance. The curtain, made from strips of agricultural netting, is 30 meters high by 40 meters long and encloses approximately 400 square meters of forest at the Wayqecha Biological Station, where Metcalfe conducted postgraduate research and first got the idea for the project. The strips, positioned to intercept the moisture from the clouds as they rise up the hillside, are suspended from steel cables strung between two aluminum towers that rise incongruously above the jungle canopy. Cloud forests like the one at Wayqecha are rare, making up about one percent of the Earth’s total woodlands, but these forests are biological hotspots. Many species of plants and animals—like the copper headed emerald hummingbird, and the recently discovered olinguito, a carnivore that looks like a teddy bear—are only found in cloud forests. No one knows how many more rare plants and animals remain undiscovered. As average temperatures continue to rise, clouds will be forced higher up mountainsides, in turn forcing the forests and the animals that call them home to migrate. Many of Metcalfe’s colleagues, like Miles Silman, a professor of conservation biology at Wake Forest University, fear that trees just aren’t moving fast enough to keep up with the current pace of climate change. If trees in cloud forests around the world can’t keep up with rising clouds, they will be left high and dry. Even if they can migrate upslope to adapt to some amount of climate change, eventually, the cloud banks could rise of the mountains entirely, leaving these forests and their species with nowhere to go. Little research has been done on the possible impacts of this scenario, and that’s where Metcalfe’s curtain comes in. Metcalfe is hoping his experiment will help us better understand how cloud forests will adapt to the loss of clouds, what trees will be better suited to deal with dryer conditions, what species won’t fare so well, and how the whole process will unfold. The curtain, funded by grants from Swedish government agencies Sida and VR, was finally finished last November, but as Metcalfe says, getting to this point was, “a bit of a saga.” There were bureaucratic delays and permits to be obtained, cargo boxes full of equipment got stuck in Peruvian customs for months, his head engineer got sick, and right when he got funding for the project, Metcalfe’s first child was born and he went on five month paternity leave. Then, there was the challenge of building the massive structure itself in the middle of a remote Peruvian jungle. Off the top of his head, John Kelson, one of the head designers and builders of the structure estimates that his crew hand-carried around 8,000 kg (17,600 pounds) of material—aluminum tower parts, steel cable, agricultural netting, food, camping supplies, giant drill bits—down muddy paths through the remote jungles of Peru. “I would be willing to bet a lot of money that no one is going to build something like this for a long time,” Metcalfe said, reflecting on the four years it took to make the curtain a reality. And there is still a long road ahead. Metcalfe estimates that it may take several years before any conclusions are drawn from the experiment. At the Wayqecha Biological Station, Metcalfe’s research assistants—young, Peruvian biologists working with the NGO ABIDA—collect data from a number of experiments set up behind Metcalfe’s cloud net. In the green tinted light coming through the mesh curtain, two of the researchers connect what looks like a vacuum hose to a PVC pipe sticking out of the ground. The other end of the hose is connected to a small box that displays the amount of CO2 being emitted by the soil. Others download data from tiny sensors the size of shirt buttons hanging from the trees that measure micro-climates, while a few collect the canopy debris caught in nets set up under the trees. This debris will be weighed to determine the amount of carbon stored in it. Collectively, the data collected by the ABIDA team every month over the next few years will give scientists a better understanding of how the forest’s carbon cycle could change as cloud banks disappear. Beisit Luz Puma-Vilca is the head field biologist at ABIDA. Her rubber boots make sucking noises in the mud as she gingerly makes her way down the steep trail to point out another experiment—a small plot of land where different tree saplings are planted to test which species will grow best in the new conditions. Beisit Luz Puma-Vilca working within the cloud forest curtain. She frets not just about rising cloud levels, but about other threats to cloud forests like mass deforestation from agricultural and ranching development, mining, lumber operations, and forest fires. To emphasize the danger, she points across the valley to a square of grass where an unprecedented wildfire three years ago consumed a large part of forest similar to the one we’re standing in. When drought hits the rainforest, deforested regions are more at risk from wildfires, which are an increasing threat across the Amazon due to climate change, population growth, and habitat degradation. If Peru’s cloud forests are lost, that would be bad news for the plants and animals living in them, but also for the surrounding ecosystems and human communities. Puma-Vilca explains that the villages and farms depend on these forests to filter and store fresh water. That water eventually makes its way into the streams that feed the Kosnipata River, seen snaking through the valley below. Back in her offices in Cusco, Puma-Vilca will compile the data her team has collected into spreadsheets; rows and columns of dizzying figures that crowd her desktop monitor—the first of the data sets to be sent to Metcalfe. It is meticulous work. Science, like the rhythms of the forest, can be slow. Hopefully, by the time the researchers have gained some understanding of how the forest will change, and what can be done to mitigate any losses, it won’t be too late. Puma-Vilca is watching the clock anxiously as CO2 levels in the atmosphere continue to rise. Daniel Setiawan is a freelance writer based out of Austin, Texas.